Michael Collins By Brendan O'Reilly, this ballad was written and recorded by Brendan. This song is one of five on the site about Michael Collins, the others are by The Wolfe Tones, Johnny McEvoy, onagh McDonagh and Sean Dunphy. All pay tribute to one of Ireland's finest rebel leaders. [C]An old man whispered [F]in my ear It was the [G]saddest thing he [C]knewWhen [Am]Irelands proudest [F]son was shot At the [G]Age of thirty [C]twoHe held my hand, his [F]eyes held tears And [G]my eyes filled up [C]tooTwas a [Am]powerful e[F]motion, for a [G]man I never [C]new. Within the crowded [F]banquet hall, the [G]old man meek and [C]mildA [Am]simple man from [F]off the land, with the [G]blue eyes of a [C]childBrought a memory that an [F]Irish Gun, shot [G]down the rebel [C]sonAnd [Am]Ireland lost her [F]laughing boy be[G]fore his work was [C]done. 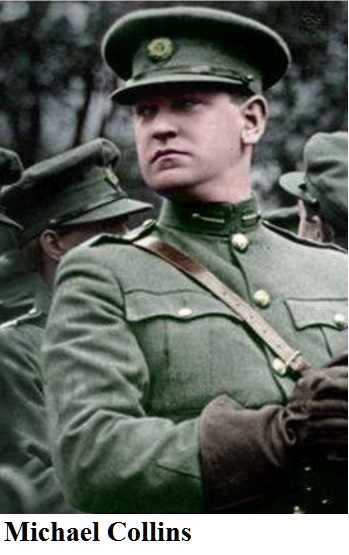 [C]Michael Collins [F]fearless son, you [G]touched the nations [C]soulTen [F]thousand pounds up[C]on your head, you [D]still achieved your [G]goalYou [C]knew the orange [F]and the green would [G]keep us yet a[C]partBut the [F]dream of Ireland [C]one and free was the [G]dream that filled your [C]heart[F] [C] [G] [C]. And an old man in a [F]banquet hall, some [G]fifty years gone [C]byeHad a [Am]sadness that would [F]never pass, in his [G]blue eyes filled to [C]cryWith the memory that an [F]Irish Gun, shot [G]down the favorite [C]sonAnd [Am]Ireland lost her [F]laughing boy be[G]fore his work was [C]done.